So, you found the perfect partner – that special someone that makes each day a little brighter. But what about a ring to symbolize your commitment? We have the perfect solution for couples that want to take their love a step further. 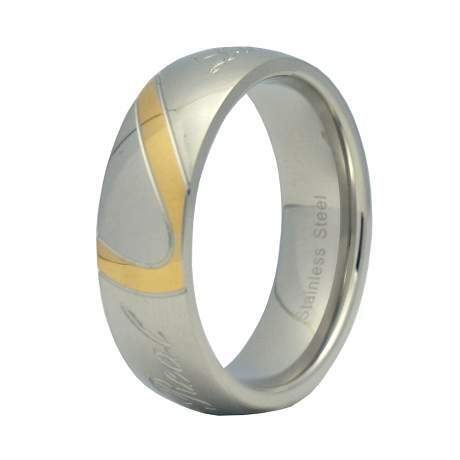 Our stainless steel “real love” engraved ring will serve as the perfect mangagement ring, wedding band, or promise ring. This accessory is sure to show that special someone that your love is forever and your bond cannot be broken. Enjoy a two-toned sense of sophistication that’s crafted with stainless steel and gold ion plating (IP). Gold IP is a widely respected alternative to expensive precious metals, which allows us to offer our stainless steel “real love” engraved ring at an irresistible price that won’t break the bank. Stainless steel is a premium alternative to platinum, silver, or other silvery metals. 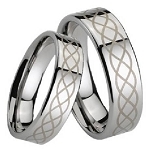 Steel like ours is commonly used to manufacture surgical products, and men with sensitive skin or known allergies to metal will be glad to know that this ring is hypoallergenic. 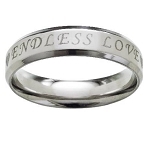 Each stainless steel “real love” engraved ring we carry is highly polished and made with precise attention to detail. We take pride in the jewelry we produce. Each wedding band we offer conveys timeless elegance to enjoy for a lifetime. Have questions? We are here to help! Contact JustMensRings.com today by phone so we can help you find the perfect way to express your love and devotion. My boyfriend loves this ring and its tough enough to stand up to him!!!! I absolutely love this ring choice. My boyfriend and I have exchanged gifts a lot, but nothing ever quite so serious as a ring. I wanted something that would hold up while he was at work, wouldn't scratch easy, would look nice and stand out from his hand, and would be comfortable to wear. This ring is all of those things. I'm very happy with this choice, and so is my boyfriend. We recently purchased this ring to be worn as a wedding band. The ring looks very nice however the lifted edge of the ring made wearing it uncomfortable for my husband so we are going with another style.